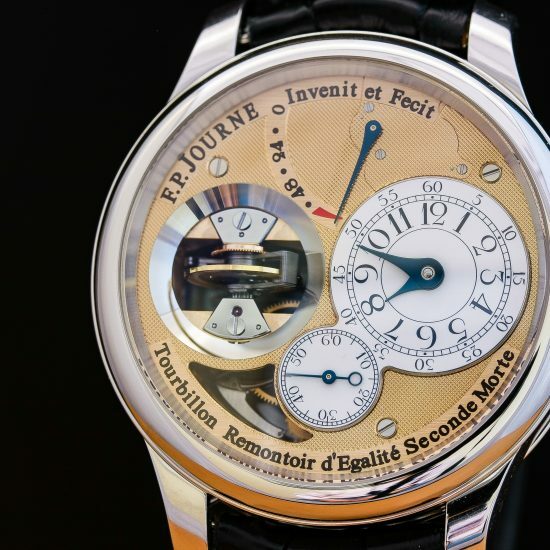 As with all the N°000 cases, the Tourbillon Souverain remains part of the Montres Journe private collection yet shows interesting characteristics that determine its uniqueness and time of casing. 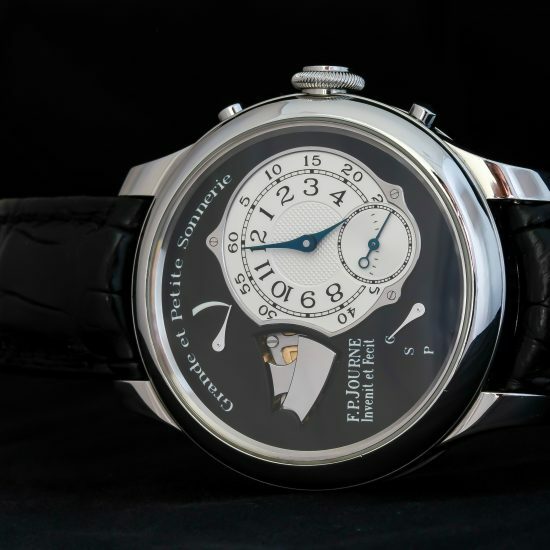 As a start, the dial appears to be one of the few hand-finished dials that were done by François-Paul Journe personally. 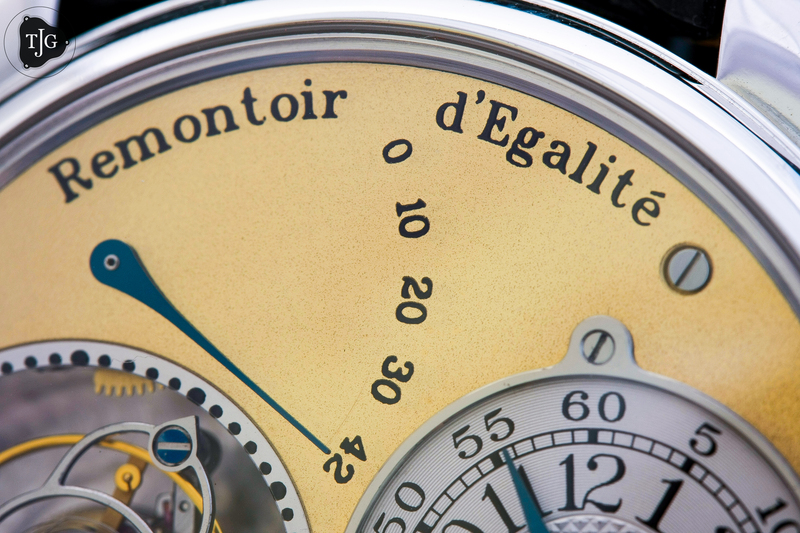 The characteristics unique to such dials were the smaller font used for the power reserve printing; the curved apostrophe in the word <d’egalité>; combined lastly with the larger ink dots for the tourbillon seconds ring. Noted is the larger screws that held the dial in place but were carried on across roughly the first 100 tourbillons. The finishing is also quite rough when examining the screws, dial texture, and that of the tourbillon cage itself. A curved remontoir propeller bridge signals an early production. 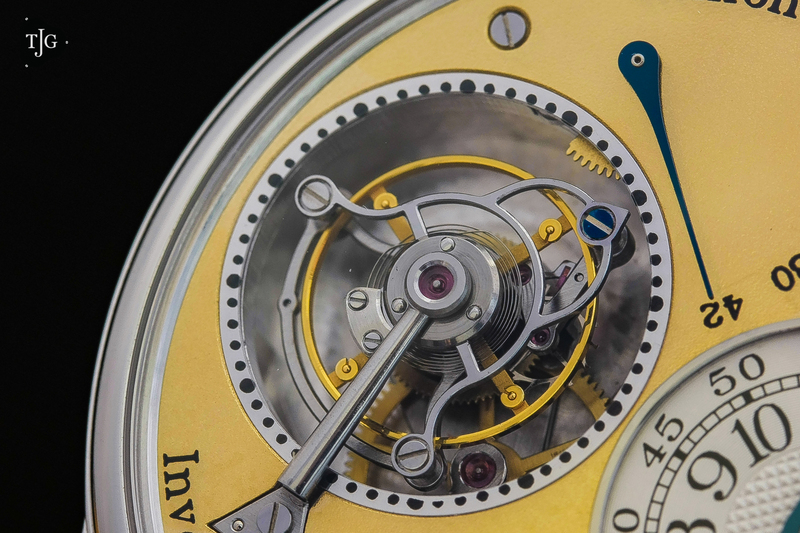 A surprising touch that caught my attention with this specific example was the presence of a blued screw on the tourbillon cage, precisely the screw at the top of the cage that is coincidentally used as a seconds indicator. The blued screw, poising hole, and larger ink dots. 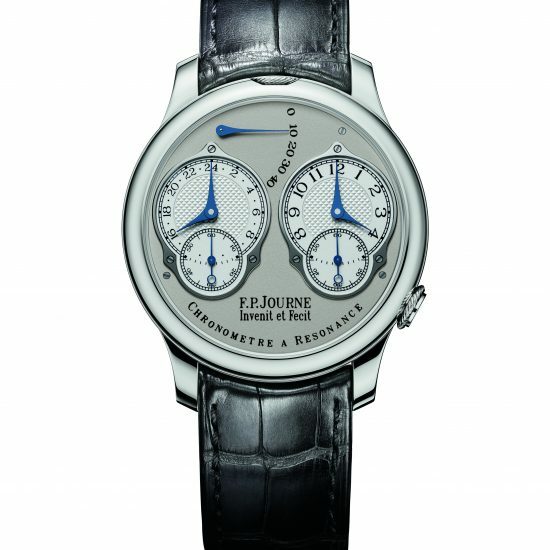 I had asked Mr. Journe if this was some sort of error but it was actually a trial. 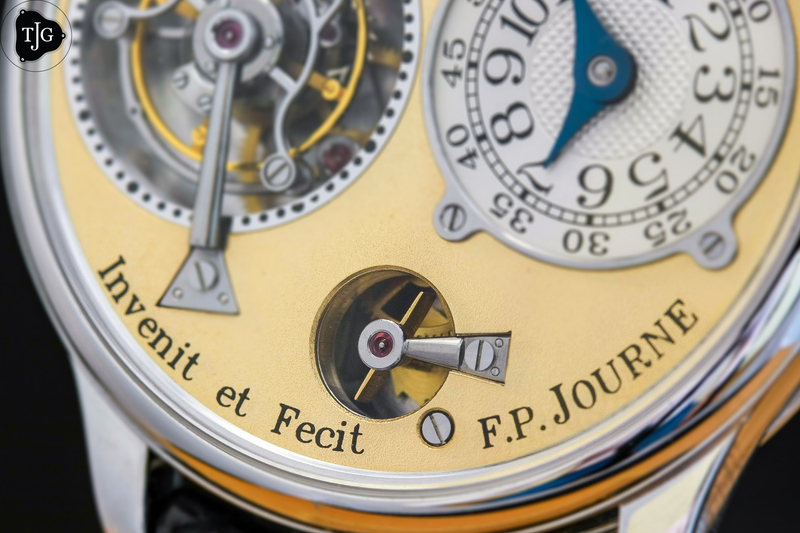 The screw, which was blued prior to slotting, was Mr. Journe’s attempt at making the seconds indicator more visible and unique. He had actually done this to a total of three or so watches in total, but later stopped as he never really opened up to the aesthetic appeal, citing the lack of symmetry due to the one blued screw. From personal experience, the screw is unique but doesn’t really provide a tremendous visual attraction and legibility. 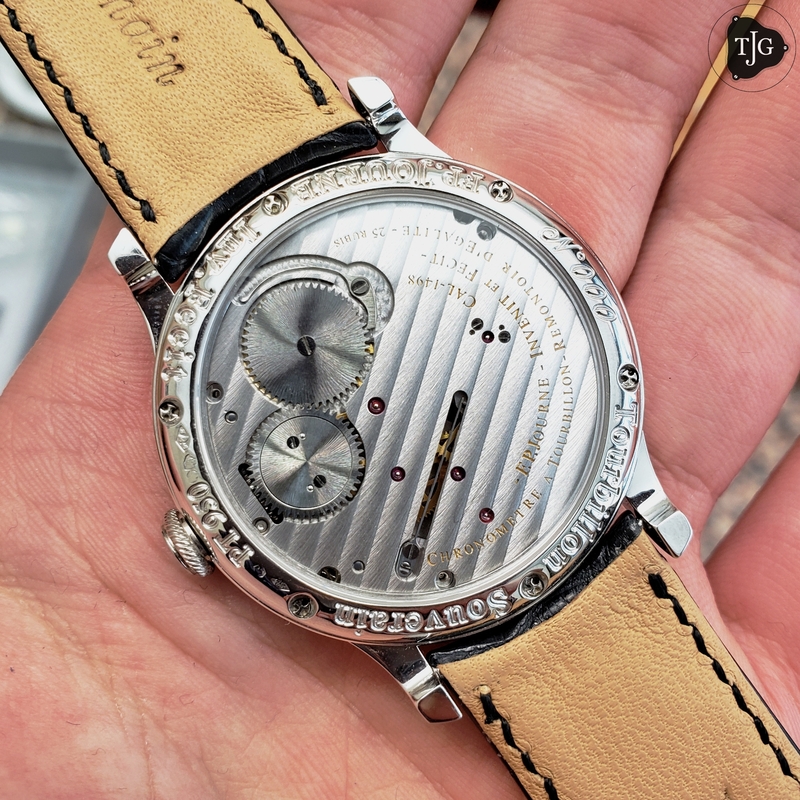 Combined with the overall polish and shine of the dial and cage, along with the actual size of the screw, it’s hard to see anyone would notice it at first, and even yet anyone would even actually use it with ease. As explained once before, case numbering and production are not necessarily done in order. Further, almost all prototypes are dismantled and destroyed, though there are some very minor yet notable exceptions. In the case of numbering, all the cases numbered ‘000’ are specifically made for company records but not cased in any specific timing. This particular example highlights a case that was made in the later years of production, or more precisely after the first 34 cases were ordered. 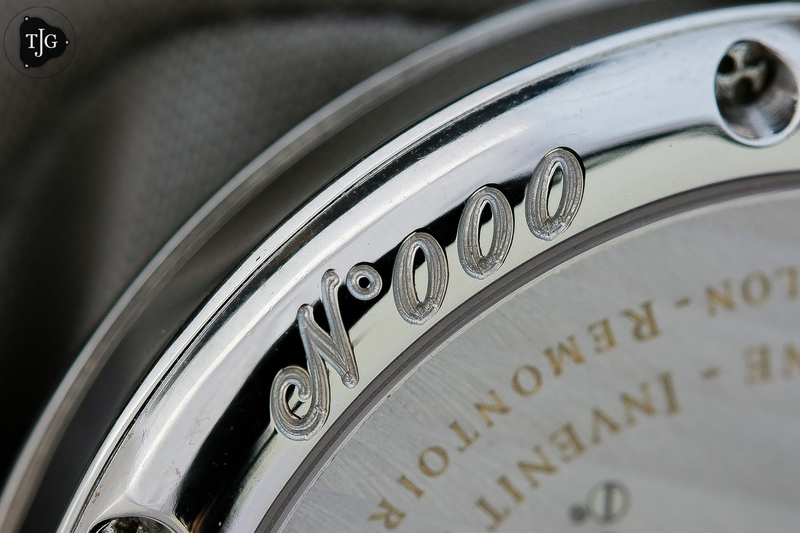 The indicator here is a result of the case engraving being laser-engraved and uniform, rather than rough and hand-engraved via a burin. All things considered, the watch is clearly a sort of “Frankenstein” with an early dial, odd blued screw, and a laser-engraved case. The contrary was seen with the N°000 Resonance which had a later dial and an early case, though also making it a “Frankenstein”. Personally, I find such characteristics fun to come across as it makes everything more ambiguous and less consistent. 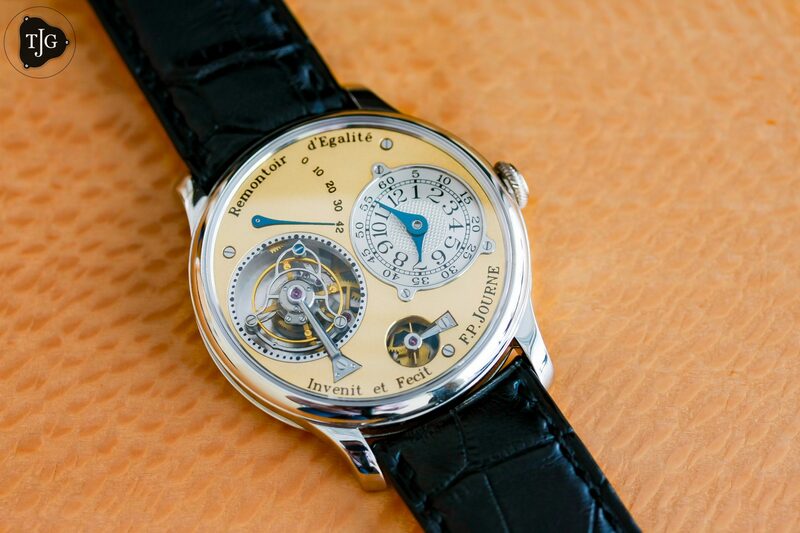 There is no hard rule when it comes to a Journe as every watch is unique in its own merits.